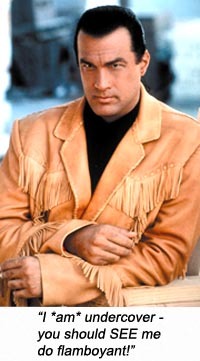 Into the backwoods of the Kentucky hills, Taggart brings his fruity designer leather jackets and ever-present ponytail. Strawberry-blonde towngirl Sarah (Marg Helgenberger) takes notice, and spills some of her own woman-waste on HIM. The Crooked Businessman (Kris Kristofferson) who dumps millions of barrels into the backwoods streams and has all the police and other EPA officers in his pocket keeps sending bad guys to beat up Taggart, and Taggart obliges by beating them up – and that’s the only reason this movie has legs at all. The singular thing that keeps FIRE DOWN BELOW watchable is Seagal’s admittedly magnificent martial artistry; well-directed by Félix Enríquez Alcalá, not cut too close to be disorienting and not over too quickly to be boring (even though Seagal uses a minimum of effort to bring his assailants down, which is one of the features of aikido – that’s why every fight involves many attackers, cos they go down quicker than a pile of bowling pins). The fiery speech that Taggart delivers to the townspeople about pulling together as a family against the “rich people” who were destroying the town, was so inspirational it made me weep. I’m still crying. Harry Dean Stanton inhabits the middle background as an old codger who helps Taggart; Levon Helm is the town preacher more expressionless than Seagal, and Stephen Lang is Sarah’s treacherous brother who gets some wondrously luminescent lime-green toxic waste spilled on him during one of those fist fights where everyone has a gun but has to get reeeal close to Taggart before they aim it, just like Boba Fett at the Pit of Sarlaac. Story and characters flit about lusterless and with no focus and the movie’s outro credits feature b/w pictures of rustic townfolk, as if the movie was some kind of tribute to the frontier spirit. Almost as laughable as Taggart’s ’80’s fashion sense. Writers: Jeb Stuart, Philip Morton. Starring: Steven Seagal, Marg Helgenberger, Stephen Lang, Brad Hunt, Kris Kristofferson, Harry Dean Stanton, Levon Helm.